The 2012 USDA plant hardiness zone map has been released. The niftiest thing about this latest release is the interactive online aspect. The USDA plant hardiness zone map shows the average lowest temperature in an area over time and is mainly used by gardeners and growers to determine which plants will be able to survive a winter. It’s also used to set crop insurance standards and model the spread of exotic weeds and insects. Zones have shifted north a little due to warmer average annual temperatures. Two zones have also been added on the warmer end of the scale – 12 and 13, both of which occur only in Hawaii and Puerto Rico…. Twenty-two years after its last revision, the U. S. Department of Agriculture finally released an update to the Plant Hardiness Zone map, which serves as a kind of detailed road map for gardeners, farmers, foresters, nurseries, or just about anyone who works with plants. Last published in 1990, the new map illustrates the effects of global warming across the country, and in a less abstract vein, how increases in temperature are impacting what people can plant, harvest or grow in their backyards. The new color-coded map, which is online, interactive, and downloadable — will surely be a welcome update to the estimated 80 million home gardeners in the U.S., in addition to those individuals and industries that rely on the data for their business. The map is used to set national crop insurance standards and predict locations at risk for weeds and troublesome invasive plants that can cause large economic and ecological impacts. The map divides the U.S. into 26 zones — each in a 5-degree Fahrenheit temperature range — to reflect growing conditions…. We cover all kinds of alternative energy and transportation on Gas2.org- but, quite honestly, when you talk about clean, sustainable personal transportation nothing beats simple, human-powered bicycles. According to U.S. Census estimates, about half of all Americans live within five miles of their workplace. Those who decided to bike those 5 miles every day rather than driving an average car could reduce total household emissions by six percent– impressive for a relatively minor tweak. So how many of us are riding bikes? Just as recently as 2010, 39.3 million Americans age seven and older were estimated to have ridden a bicycle six times or more in a year (according to the National Sporting Goods Association). This was up about 3% from 2009. And while we don’t know exactly how often those folks rode on errands or to work, we do know that Americans don’t commute by bicycle as much as, say, our friends in The Netherlands. That seems to be changing. There is a definite push in major cities across our nation to make cycling for transportation as prevalent as biking for pleasure. Bike advocates and enthusiasts have been working for years to make commuting by bike a safe and viable option for fellow citizens. Take a tour of our union from a cyclist’s perspective and see what leading-edge bike advocates are doing to push for wider adoption of bicycles as transportation in their cities, including the cultural, infrastructure and policy changes needed to make that happen…. We previously wrote about the major advances being made to the bike infrastructure in Miami-Dade county in our first Bike the Nation post. It’s clear that Miami is set to have a bicycle renaissance of its own thanks to local support, the true impetus for change. Any given day there is a group ride scheduled, a petition signing at local markets, and countless blogs and twitter streams feeding the movement. Take a look at how Miamians are enjoying their bikes, and their goals and issues in 2012…. Self-sufficiency is a big part of living a more sustainable lifestyle. When you’re not dependent on others for your food, water, energy, clothes, or entertainment, you have more control over how those things are grown, purified, and produced. Over the past few years, we’ve seen individuals become self-sufficient by growing their own food or going off-grid through renewable energy, but rarely have we seen an entire town support the idea of long-term food independence the way the small Victorian mill town of Todmorden, West Yorkshire has. Citizens in the town have rallied behind an effort called “Incredible Edible,” a program and website dedicated to making the town of Todmorden food-independent by 2018…. According to a study published in the January 2012 American Journal of Clinical Nutrition, a diet rich in plant-based compounds reduces risk of death from heart disease and stroke. The study focused on compounds called flavonoids, found in a wide variety of plant foods such as fruits, vegetables, nuts, tea, wine, and dark chocolate– apples, berries, citrus fruits, leafy greens, broccoli, avocados, and almonds are common examples of flavonoid-rich foods. Flavonoids are considered to be beneficial due to their anti-inflammatory and antioxidant properties, limiting cellular damage that can cause chronic disease. These plant-based compounds are known to play a role in reduced cancer risk, as well as in the reduced risk of heart disease for women with type 2 diabetes. Nearly 100,000 mature adults participated in the study, with an average age of 70. Participants filled out questionnaires on diet, lifestyle, and medical history, and then researchers tracked their health status for seven years. Researchers accounted for relevant risk factors such as high cholesterol, obesity, hypertension, and family history of heart disease…. Food Fact: More than 50 scientists, inluding 5 Nobel laureates, called methyl iodide “one of the more toxic chemicals used in manufacturing.” The fumigant is still legal and used in many conventional strawberry fields. Mamas and papas and babes—oh, my! Did you know that the fur industry breaks up families? Yep, animals experience emotions, are capable of love, and form strong social bonds with those closest to them. See for yourself … (link above). We really do try to Pollan it up and do the whole “eat food, not too much, mostly plants” bit. But “mostly plants” obviously means “sometimes bacon.” And maybe the farmers’ market wasn’t open, so we bought that bacon at the store. Oh, but it was good bacon! “Raised without antibiotics” bacon! That’s something, right? Nope, not really, according to a new study from a group of University of Iowa scientists. This group tested 395 samples of pork from 36 stores in Iowa, Minnesota, and New Jersey. Of those, 6.6 percent had creepy, drug-resistant staph bacteria (shorthand: MRSA) on them. And there was no difference, statistically, between the normal pork products and the ones raised with alternative, antibiotic-free methods. Antibiotic-resistant bacteria are usually associated with factory farms where animals get pumped full of drugs to keep them from keeling over. But apparently they don’t have a monopoly, and being raised on a non-industrial farm is no guarantee of a clean piggie. Still, it’s not like MRSA is the only part of the industrial food system that’s dysfunctional, so it’s still worth going for sustainably farmed meat. Also, for what it’s worth, veggie bacon almost certainly does not have MRSA! Or, for an actually delicious (seasonal!) 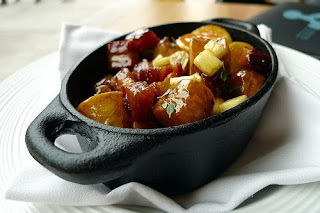 greasy treat, I recommend roasted sunchokes…. At the Transportation Research Board’s 91st annual meeting here in DC, it’s hard to miss the booth handing out copies of a bright blue pamphlet filled with illustrations of busy tree-lined streets, where bicyclists and buses work their way through a bustling urban bazaar. The booth is the Congress for New Urbanism’s “occupation” of TRB, and the pamphlet is their new illustrated Sustainable Street Network Principles, a document aimed at explaining in very basic terms what’s wrong with America’s streets — and how to fix them. The goal of the Principles is to promote development patterns that add value to communities. The way to do that, said CNU President John Norquist, is to design streets to play three simultaneous roles: that of a transportation thoroughfare, a commercial marketplace, and a public space. “Typically, U.S. DOT and State DOTs tend to look at roads only in the dimension of movement, and even in that one dimension, their rural-style forms fail in the city,” Norquist says. A U.S. scientific panel is calling for a systematic study of the growing use of nanomaterials in industry, saying little is known about the risk of the microscopic particles increasingly being used in everything from cosmetics to clothing and paint. The National Research Council (NRC), part of the U.S. National Academy of Sciences, noted that the use of nanomaterials — measured on the scale of billionths of a meter — is growing rapidly, rising from $225 billion in nanotechnology-based products in 2009 to an estimated $3 trillion by 2015. But the NRC said that little is known about the potential risks posed by nanomaterials, the pathways and plausibility of exposure, and the severity of such exposure. The NRC called for a systematic research effort that would identify sources of nanomaterials releases, the different industrial processes that affect exposure and hazards, and nanomaterial interactions from a sub-cellular to an ecosystem level. Nanomaterials — often made from minerals such as gold, silver, carbon, zinc, and aluminum — have unique electrical, chemical, and optical properties. “The number and variety of nanomaterials is just mind-boggling,” said Mark R. Wiesner, an engineering professor at Duke University and a member of the panel…. I might have to buy a new car in a few years. So in preparation for that inevitable event, I am always interested in new automobile technology and what innovative designs have been incorporated into the shiny new cars coming off the assembly line. And more than any fancy bells and whistles, I am most interested in how energy efficient a car is. On Monday, we took a look at one option for recycling old eyeglasses: using them as a crafting material. Nothing wrong with that, of course, but as a reader pointed out, you can also donate them to organizations like the Lions’ Club. So, when a representative of Mezzner pointed me to this infographic that spells out the need for glasses around the world, I took it as a sign… If you’ve got glasses in good working order, donation is the best option; if your frames are broken or otherwise unusable as glasses, upcycle away! Read through, and take a look particularly at the potential for self-adjusting glasses: these strike me as having real potential to not only serve the vision needs of many around the globe, but to also cut back on the resources that go into new glasses for changed prescriptions….